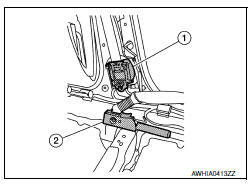 Air bag diagnosis sensor unit Refer to SRC-8, "Air Bag Diagnosis Sensor Unit". Driver air bag module Refer to SRC-7, "Driver Air Bag Module". Front passenger air bag module Refer to SRC-7, "Front Passenger Air Bag Module". Front side air bag module Refer to SRC-7, "Front Side Air Bag Module"
Side curtain air bag module Refer to SRC-7, "Side Curtain Air Bag Module". 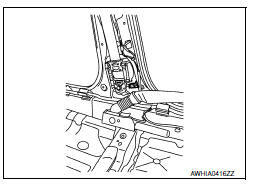 Front seat belt pre-tensioner Refer to SRC-8, "Front Seat Belt Pre-tensioner". Occupant classification system Refer to SRC-12, "OCCUPANT CLASSIFICATION SYSTEM : System Description". Crash zone sensor Refer to SRC-8, "Crash Zone Sensor". 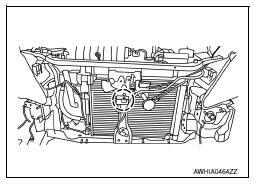 Front side air bag (satellite) sensor Refer to SRC-8, "Front Side Air Bag Satellite Sensor". 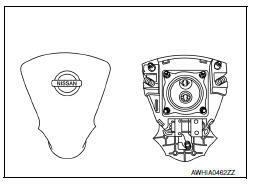 Rear side air bag (satellite) sensor Refer to SRC-9, "Rear Side Air Bag Satellite Sensor". Front door (satellite) sensor Refer to SRC-9, "Front Door Satellite Sensor". Seat belt buckle switch The driver seat belt buckle switch and passenger seat belt buckle switch provide the seat belt buckle signals to the air bag diagnosis sensor unit and the combination meter. Spiral cable The spiral cable provides a rotating physical connection to the driver air bag module. Combination meter The combination meter displays the air bag warning lamp and the seat belt warning lamp. The air bag warning lamp is used for diagnosis in User Mode and may be used to display diagnostic trouble codes without the use of the CONSULT. The driver air bag module is dual stage and located in the steering wheel assembly. It operates with the SRS system in a frontal collision exceeding a specified level. The front passenger air bag module is dual stage and is located behind the instrument panel assembly. It operates with the SRS system in a frontal collision exceeding a specified level. Refer to SRC- 11, "SRS AIR BAG SYSTEM : System Description" for more information. 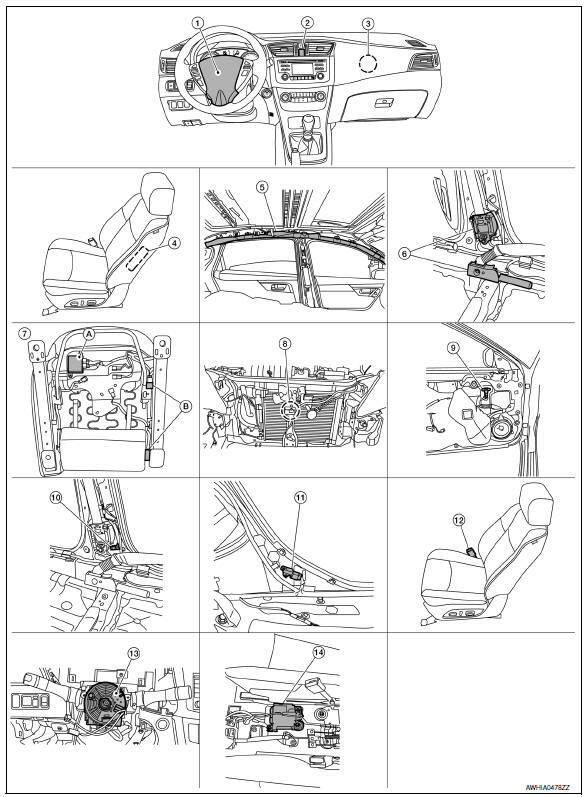 Front side air bag modules are built into the front seatback assemblies. Vehicles with side air bags are equipped with labels as shown. Side curtain air bag modules are located above the vehicle headlining. 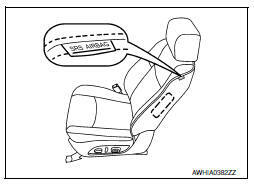 Vehicles with side curtain air bags are equipped with labels on the pillar upper finishers. The seat belt pre-tensioner system with load limiter is installed for both the driver's seat and the front passenger's seat. It operates simultaneously with the SRS air bag system in the event of a frontal collision with an impact exceeding a specified level. 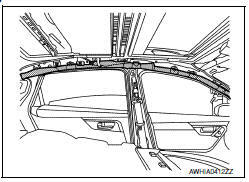 When the frontal collision with an impact exceeding a specified level occurs, seat belt slack resulting from clothing or other factors is immediately taken up by the shoulder belt pre-tensioner (1) as well as the lap belt pre-tensioner (2). Vehicle passengers are securely restrained. When passengers in a vehicle are thrown forward in a collision and the restraining force of the seat belt exceeds a specified level, the load limiter permits the specified extension of the seat belt by the twisting of the ELR shaft, and a relaxation of the chest-area seat belt web tension while maintaining force. 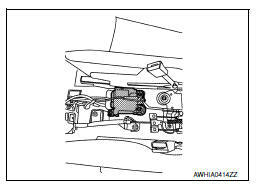 The air bag diagnosis sensor unit is located under the center console assembly. The air bag diagnosis sensor unit receives signals from multiple SRS sensors and controls the deployment of the air bags. The deployment of the air bags depends on the type and severity of the collision. The air bag diagnosis sensor unit has selfdiagnosis capability through the use of the CONSULT as well as flash codes displayed by the air bag warning lamp. The crash zone sensor is located infront of the radiator. The crash zone sensor sends signals to the air bag diagnosis sensor unit during a frontal collision. This sensor may be identified by a yellow connector. The front side air bag satellite sensors are located on the front center pillar LH and RH next to the seat belt pretensioners. The front side air bag satellite sensors send signals to the air bag diagnosis sensor unit during a side collision. These sensors may be identified by yellow connectors. The rear side air bag satellite sensors are located behind the dash side lower finisher LH and RH. The rear side air bag satellite sensors send signals to the air bag diagnosis sensor unit during a side collision. These sensors may be identified by yellow connectors. The front door satellite sensors are located in the driver and passenger doors. 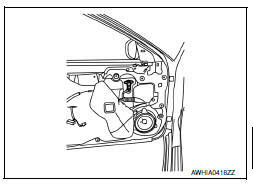 The sensors detect sudden pressure changes inside the door cavity and then send signals to the air bag diagnosis sensor unit during a side collision. These sensors may be identified by yellow connectors. The following SRS components use direct-connect style harness connectors. Always pull up to release locking tab prior to removing connector from SRS component. Always push down to lock locking tab after installing connector to SRS component. When locked, the locking tab is level with the connector housing. A new style slide double locking type connector is used on certain systems and components, especially those related to airbag control systems. The slide double locking type connectors help prevent incomplete locking and accidental looseness or disconnection. The slide double locking type connectors are disconnected by pushing or pulling the slider. Refer to the figure below. Do not pull the harness or wires when disconnecting the connector.